Any person who holds the power of moving another individual towards an idea or simply a high level of feeling is a self-generating leader. The inner spirit of this individual raises awareness that his or her own capabilities can bring about much needed inspiration on other people, community, and even on the world. Additionally, this person is not self-contained and only functions with the belief that every human has the capacity and the ability to do bring about the same change. All that is required is an uplifting experience. We all know of a great person whom we feel is simply a creative fire. We may know individuals whom we would call original and we know others who are creative. However, I know a great person who many would say is a spirit invented by combining all of these factors and many more. This person is a brilliant visionary who, with flair and aptitude, is illuminating lives and imparting inspiration one eye at a time. Dr. Arun C. Gulani, director of the Gulani Vision Institute, located in Jacksonville, Florida is providing flashlights to patients who are searching for a way to Brighten with Enlightenment. This world-renowned eye surgeon has been transforming the way patients are living their lives by increasing knowledge and dissipating ignorance. There is nothing miniature about this surgeon's belief on how patients should be treated. Patients who visit the institute are improved physically, socially, and intellectually- furthering them to regain whatever spiritual sense they may have lost. Dr. Gulani's patients find themselves edified by his many talents, which only encourages them to improve their own lives. Many patients all across the country are discovering that the healthcare crisis is also causing a crisis in the way patients are treated. Ophthalmology, one of the most prominent and distinguished specialties, is known for its luxury of devouring patients with care, respect, and ambition for achieving superb results. However, many eye surgeons across the nation are rushing through their patients for financial gain only and as a result, many patients are left in the dark. Some who undergo surgery are left with minimal improvements while others are turned away without any further attention. Fortunately, many patients are discovering the Gulani Vision Institute not by fancy billboards and overpriced commercials, but by many independent websites that previous patients have written on to discuss their experience and provide guided support for others searching for help. Amazingly, most of the patients that the institute receives are by referrals from previous patients who recommend Dr. Gulani to their family and friends. Like a domino effect, these previous patients express that Dr. Gulani has not only welcomed them, but has taken them under his wing and has restored their sight, their confidence, and their ability to live their lives much brighter than before. 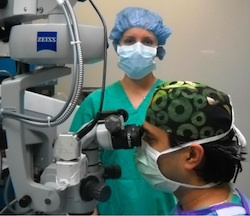 I had the opportunity to speak with some of Dr. Gulani's former patients whose stories about how this eye surgeon has completely changed their life is simply remarkable. His talents and his simple but powerful logic believe that every patient should be treated as an individual and this philosophy extends from patients and onto those who are simply in his presence. When I met Dr. Gulani for the very first time, I thought to myself who is this doctor and why is he so special? After observing Dr. Gulani at his institute for just one day, I walked away with an answer for that very question. Dr. Gulani is nothing less than a genius. His philosophy about the way business, medicine, science, and ethics ought to work actually weaves these components into one and does not separate them like many practices all over the country do. However, besides his extraordinary abilities and technical skills that result in his patients, colleagues, and staff respecting and believing so highly of him- it is his warmth and compassion that are winning over all the patients. Dr. Gulani is a true representative of how every single medical doctor in the US should be. He inspires all those around him regardless of their age, their status in life, where they want go, and who they may want to be. Besides the patients, who accompany Dr. Gulani in a model to perfect lives by perfecting eyes, Dr. Gulani prevails as a leading educator, mentor, and a forerunner for any person who seeks guidance.